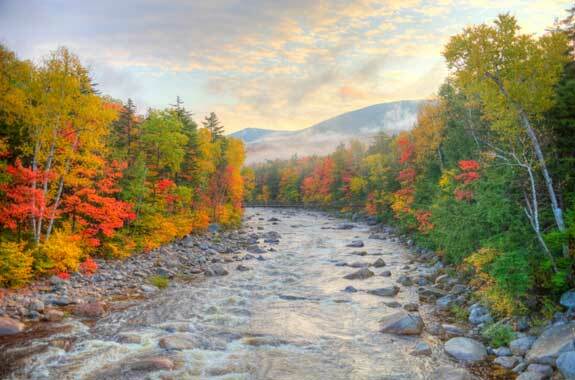 Autumn along the Swift River in the White Mountains National Forest. 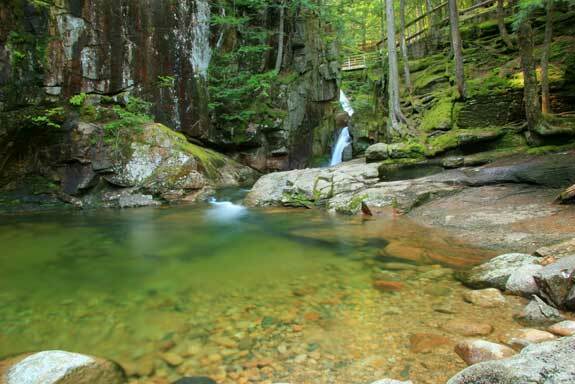 If you want to get back to nature and experience some of Maine’s renown wild beauty up close and personal, set aside a day – or a few – to explore White Mountain National Forest. This 777,496-acre destination straddles the border between southwestern Maine and New Hampshire and is the only national forest in either state. This land long held spiritual significance to the indigenous Maliseet, Penobscot, Micman and Passamaquoddy peoples. Early settlers were drawn to the region, too; the forest was settled in the early 1600s and many historic sites — farmsteads, railroads, cemeteries and abandoned villages – remain today. In 1867, New Hampshire’s governor sold thousands of acres in the region to logging companies. Three decades later, 832 sawmills were operating in the area and much of the forest was gone. In 1914, the passage of the Weeks Act — a law permitting the federal government to purchase private land and protect headwaters – allowed the U.S. Forest Service to buy the burned and cut regions of the once-mighty forest. Though the first sale only included 7,000 acres – at a bargain price of $13 per acre – today, White Mountain National Forest has been nurtured back to health and welcomes more than seven million annual visitors. With more than 1,200 miles of hiking trails, 23 campgrounds, 14 picnic grounds and nine protected scenic areas, it’s not hard to see why outdoor lovers flock to this region. Speaking of flocks, White Mountain National Forest is a prime bird-watching destination; in fact, the American Bird Conservancy it on its list of the country’s most important bird areas. More than 200 species of birds call the forest home, including permanent residents and migratory visitors. From red-throated loons to great egrets, snow geese to red-tailed hawks, bird-watchers will get an eyeful. The forest is also home to a peregrine falcon reintroduction program. But birds aren’t the only residents. The northernmost portions of the forest are well-known for moose sightings; other commonly seen wildlife include black bears, deer, turtles, snakes and frogs. Visitors can watch for wildlife at the viewing blind near Deer Hill. The region is also home to a range of native plants, from blueberries to paper birch trees, as well as sensitive species such as American ginseng, silverleaf willows and three-leaved black snakeroot. Most people visit the White Mountain National Forest for its diverse range of recreational activities. With more than 1,000 miles of trails to choose from, it’s not hard to see why hiking is one of the most popular activities; in fact, part of the Appalachian Trail winds through the forest. Hiking trails range from easy to advanced; many offer stunning mountain or water views, such as the Glen Ellis Falls Trail, an easy .3 mile trek past a 70-foot waterfall, and the more difficult 1.5-mile Roost trail that offers views of the Wild River Valley. Though the many trails offer the perfect opportunity to walk, hike or bike, you can also explore by car. Route 302 offers unparalleled views of the Presidential Mountain Range, including Mt. Washington, the region’s highest peak at 6,288 feet. The Patte Brook Auto Tour, a self-guided drive through the Androscoggin Ranger District, provides first-hand examples of the region’s resource management. The 34-mile Kancamagus Scenic Byway winds through the heart of the mountains. Along the way, look for the forest’s two National Registers of Historic places sites: Brickett Place on Route 113 near the border of Maine and New Hampshire, and the Russell Colbath House near Albany on the Kanmagus Scenic Byway. There are also 100 waterfalls in the forest, from the 70-foot Crystal Cascade to Lower Falls, which also features a sandy swimming beach. If one day in the forest just isn’t enough, stay at one of the 23 developed campgrounds that dot the forest. Some offer flush toilets and running water, such as Basin and Jigger Johnson, while others are more rustic, such as Cold River and Covered Bridge. Most are open from mid-May through October. Three cabins are also available for rent. Other summer recreational activities include ATV trails, canoeing, climbing, fishing, geocaching, horseback riding and swimming. October visitors can drive the Kanmagus to view the stunning fall foliage. In the winter, visitors can ski, snowmobile or snowshoe. Visitors must purchase a pass to enter the forest. Day passes start at $3, 1- to 7-day passes are $5, and annual passes start at $20. To learn more about White Mountain National Forest, stop by the White Mountain Visitor Center in Lincoln. It’s open from 9:00 a.m. to 3:30 p.m. every day except Tuesday and Thursday. No matter which time of you year you visit or which recreational activities you choose, the White Mountain National Forest offers pristine wilderness and scenic views you’ll never forget. For more information call 603 536-6100. Scenic Sabbaday Falls off the Kancamagus Highway in the New Hampshire section of the White Mountains National Forest.